My first book, The Sacred Science of Ancient Japan, has been published. If you have any questions or comments about the book please leave a comment on this blog post. 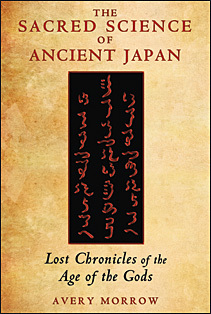 In my research on Japanese “parahistory”, the name I give to a large collection of documents in ancient languages that are claimed to have been kept secretly in the hands of shrine families for countless centuries, I am reading a lot of books, mostly written by amateur researchers who think they have discovered an amazing secret. Here is an exception: a book written by self-styled professionals, who doubt the truth of the documents. But their mentality is far less creative and positive than the amateurs, who can simply claim that they are learning the truth about Japanese history. With one exception, they really don’t have much to say in their own defense. Instead of including them in my forthcoming book I will summarize what was said here. This is one of three “academic” Japanese books devoted to parahistory that I am aware of. You would expect these “academics” to engage in an open-minded analysis of the importance of parahistory, but they did not produce any insight so amazing I would want to include it in my book. The first five chapters are devoted to these introductory questions, but with one exception I found them unsatisfying. Outside of conveying actual historical facts, their primary goal seems to be enforcing the materialist-scientific case against the upstart amateurs. Harada, a scholar of the occult and of civilization, could be expected to offer a unique perspective on how parahistory changes our view of civilization. Instead, after explaining how parahistorical research was largely naïve and uncritical in the kindai, and how a second boom coincided with the Yamatai craze of the 1970s, Harada leaves only a hint of deeper analysis. He points us towards the Jewish-Italian Carlo Ginzburg’s microhistory. Ginzburg’s idea is to avoid the grand narrative of history, kings, wars, etc. and focus on small events. This approach to history is exemplified by The Cheese and the Worms (1976), a book where a 16th century dialogue between an eccentric miller and his Catholic inquistors becomes symbolic of a so-called “popular culture” of the lower classes being suppressed by “high culture”. Here’s the problem: microhistory is neither useful nor applicable. It’s not useful because it doesn’t actually tell you what parahistory means, it just implies that it could be relevant as a “symbol” of the times. What is it a symbol of, and why? Microhistory doesn’t give you any hints; Ginzburg, for example, considers a focus on small things necessary to obtain his Marxist portrait of “the people”, a construct that he believes has been silenced by the major events of history, but I don’t think he means to limit other historians to that purpose. You can fill in the blank with whatever you like, and Harada only provides inklings of what that might be. More importantly, microhistory is not applicable, because parahistory is not a simple instance of an ordinary event, like the miller interacting with inquisitors. In fact, parahistory is purposefully entangled with the “grand narrative” of the official Japanese histories, and as a subject of study it cannot be isolated from Japan’s “megahistory”. If any parahistory is true, the entire narrative of Japan will be changed! So, I do not consider his historiographical suggestion at all useful. In fact, this was really the worst possible paradigm to suggest for parahistory. This actually contains no explanation whatsoever of why the topic the author is studying is important. It’s a mere analysis of some of the common themes shared by the Ugaya Dynasty branch of parahistories, and the author appears to present it to readers as a sort of logic puzzle inviting further analysis, which has no meaning beyond being a fun game for old men. Over 20 years ago, I noticed that there exists several different histories of the Japanese archipelago, looking from a different viewpoint from the “history of the Japanese nation” we and our children learn in school. Up until then, I too thought “there is only one Japanese history.” No, I should say rather “I had been convinced”. I can’t call it anything but my school’s integrated Japanization brainwashing. For the past 2000 years, we who are born as human have been educated to believe we are Japanese, humans of our country. us so-called “Yayoi period Japanese” are the weird ones! [Before us, Japanese people] up to the Jomon period preserved a way of life that protected the Earth for cycles of tens of thousands of years … Who is it who has been constantly discriminating against the people who lived before the Jomon period as stupid savages? Japanese history education, from that beginning until the present day’s government-administered school education, has been centered in this fascism. Kume begins by explaining the concept of “fetishism” backwards, starting with Alfred Binet’s 19th century sexual fetishism, and then moving back to the original anthropological concept proposed by Brosses, which he then fetishizes to claim that history itself could be a fetish. The subject is not returned to, which makes me wonder why he introduced it in the first place if not to obliquely insult the concept of history. The essay continues with useful facts about parahistory but no overarching structure. In the concluding paragraph, Kume winds down his discussion with, “Therefore, parahistory is fetishism. I guess there might be some problems with that, but I think it’s a cool idea. Welp, hope you enjoyed my essay!” I don’t really have much to add to that stunning insight. Like the previous writers, he doesn’t make an effective apology for his own research. I have to admit, I don’t know why this person is included in this supposedly academic book, because he himself is involved in the sale of magical amulets and other spurious items. Anyway, he just talks about the influence of the Takenouchi Documents on Mahikari, a link so prominent that American scholars have already noted it; it’s hardly “hidden”. The motive for studying parahistory would ostensibly be to help stamp out cults, but this would seem to infringe on Yamada’s own turf, as it were. And here, finally, is the good essay. Yes, “Arafuka Michinari’s Parapsychological Approach to Prehistory Research” is the good essay, the only one that actually had an influence on the small readership of this book. Sakai, founder of the Life Energy Research Institute (生体エネルギー研究所), introduces the virtually unknown spirtualist Michinari, by way of an anecdote about a pyramid-shaped rock he found while hiking in Aomori. 「私が気付いたでなく、この巨石が気付かせたのであろうか？」 “Did I notice the rock, or was the rock brought to my attention?” he asks, segueing into a discussion of the difference between material-scientific and spiritual knowledge. I note with no small amusement that this guy is the only writer among these “academics” to actually use full citations and footnotes. For Imura, the process of reading the ancients becomes progressively more difficult as we move backwards from medieval into classical times. Medieval writers can be sometimes understood by literate people. For the Kojiki and Nihon Shoki, we have almost unintelligible language, which can be read only by specialists who constantly argue about meaning. For the Yayoi and Jomon people, though, we pass out of specialization entirely and into an entirely different, transcendental realm of knowledge: the era of the kamiyo moji, scripts of the age of the gods, whose scientific truth value is clearly in doubt, but which seem to hint at some knowledge earlier than the Kojiki. The distortion is greater as you go further back, but the “romance” increases as well. The rest of this essay will be included in my book!